Our disABILITY Awareness Program utilizes the talents and voices of multiple speakers to spread awareness and acceptance of all to our local community. To celebrate Disability Awareness Month, we’ve interviewed another one of our speakers, Mark Dresen. 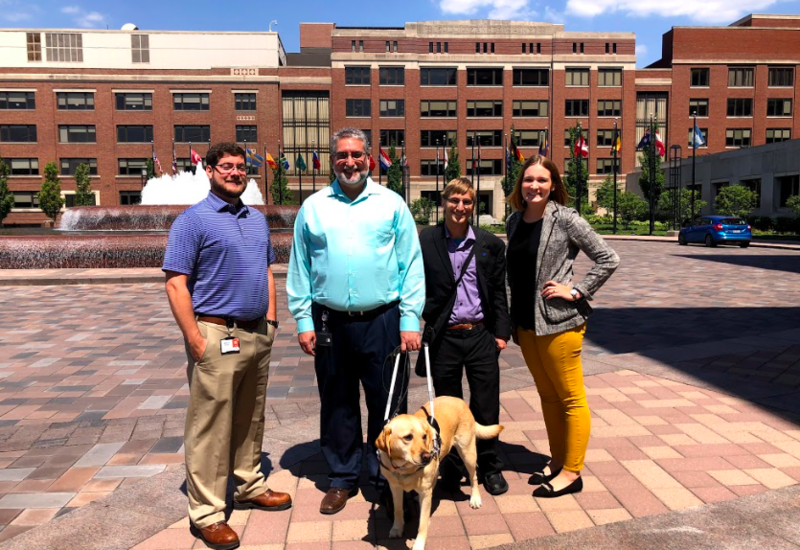 Mark works for Eli Lilly, and speaks for the Joseph Maley Foundation about his visual impairment. Keep reading to learn more about why Mark thinks disability awareness education is so important, and why he supports JMF. How have you come to speak for the Joseph Maley Foundation and our disABILITY Awareness Program? For years I have tried to be a motivation for change, both within the community I live in as well as within the disabled community. As part of that effort, I had the opportunity to become the Chair of my employer’s Working and Living with Disabilities employee resource group. Last year, we decided to partner with the Joseph Maley Foundation to host a workshop for Take Your Kids to Work Day, which would focus on exposing children to disabilities in a positive way – educating them, exposing them to ways that the disabled adapt and then allowing them to experience a project that would allow them to learn how to adapt first hand. It was a huge success. We then invited one of their speakers to address a group at work. Once again, the event went well, and I had the opportunity to address the group at the end of the presentation. One of the Joseph Maley staff mentioned that they thought I should come and speak for them sometime and I thought it was an excellent idea. It’s been a series of great experiences ever since. Why do you believe disability awareness education is important for students? I believe that one of the greatest hurdles the disabled face is fear and ignorance in the general public. Lack of understanding breeds an environment where imagination and insensitivity are allowed to drive social interactions with the disabled. The best way to correct this is to expose people to the disabled: their dreams, feelings, struggles, passions, skills and most important, their normalcy. Although everyone can use this exposure, starting with the young allows us to erase some of the social problems before they develop and hopefully prevents some of the emotional harm for student’s peers that may have a disability. Do you find that people assume things about you because of your disability? What is one of these assumptions that you’d like to dispel? For myself, it would be the belief that blindness is all or nothing. Many think that because I wear glasses I must not really be blind However, the majority of people that are visually impaired have some level of sight still, even if it’s just the perception of light or movement. But, to expand my answer outside of my own disability, it would have to be the assumption that individuals with disabilities somehow cease to be seen as having significant contributions to make to the world. It’s just not true and history has so many great figures, both old and modern that prove it, and yet the impression persists. When our dA speakers have finished speaking there is usually a question and answer portion with the audience, have you had any questions stick out amongst the rest in your time speaking for us? It’s not that a single question sticks out as much as the caliber of the questions. Of course you get some that are just meant to be interesting or fun and that is certainly part of the intended experience. But, some of the questions from the youth have been deep and well thought out and that impresses me. It means that what we’re doing is having an impact. March is Disability Awareness Month, what would you like people to become more aware of when it comes to people with disabilities? Be aware of what you can learn from them. These are patient, motivated, intelligent individuals with extraordinary problem solving skills and the ability to see things in very unique ways. There is much that can be learned if you’re willing to politely ask without preconceived notions of the quality or content of their answer and then, just as important as being willing to ask, make sure you actively listen. More often than not, they will surprise you. Not everyone is comfortable with their disability or with talking about it. I believe that if you have those levels of comfort, you have a “voice,” and if you have a voice, you should use it to make a difference, not only for yourself, but for those who don’t have one yet and may never have one. Just because they don’t have a “voice” yet doesn’t mean they don’t deserve the opportunity to be heard, even if through someone else who does. Someone who understands their pain, frustration, and desire for a better tomorrow. JMF has a voice and a similar desire to my own: to raise that voice on behalf of the disabled everywhere…and two voices are always heard better than one. With JMF and its many partnering individuals, those “voices” become a chorus and music like that is always worth being a part of.